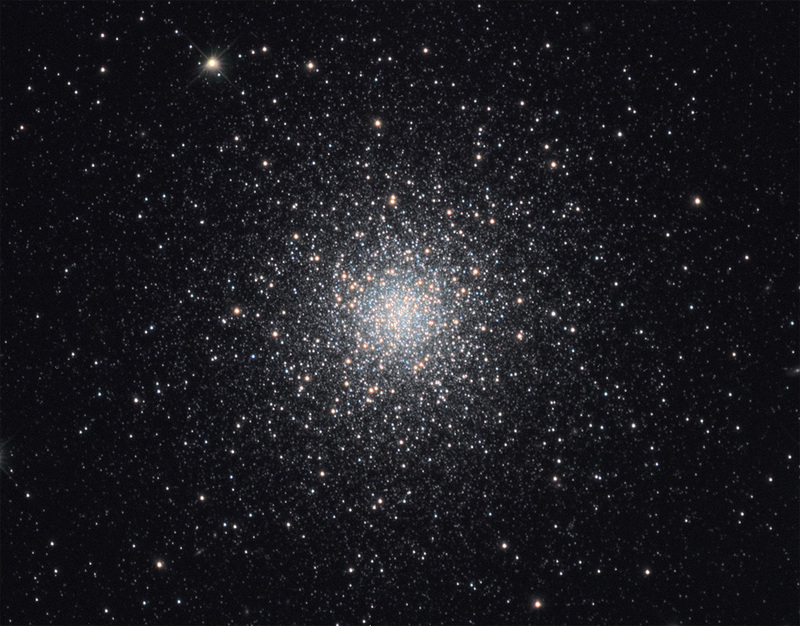 Nearly rivaling The Great Cluster of Hercules (M13) in splendor, M3 is an outstanding example of a globular cluster. Discovered on May 3, 1764 by Charles Messier, it lies about 34000 light years from earth and spans about 180 light years from end to end. Populated by approximately 500,000 stars and shining with a luminosity of about 300,000 suns, M3 is a visible to the naked eye from a dark sky site. It holds the distinction of having had more cluster-type RR Lyrae Cepheid variable stars discovered within its confines than any other globular cluster in the Milky Way galaxy. Cepheid variable stars are "standard candles" discovered by astronomers in the first half of the 20th century to extend our understanding of the size of the universe. By measuring the period and apparent magnitude of such stars, a determination of absolute magnitude and therefore distance can be obtained. Examples of Cepheid variable stars include the well known stars Polaris and the "standard" for stars of this type, Delta Cephei. This image was the result of a collaborative effort between Dave Jurasevich and David Held, sharing data acquisition and processing tasks.